Wolferton01553 763044work VillageThe village of Wolferton is situated 7 miles north of King’s Lynn and just 2 miles from Sandringham House. Indeed the village is located within the Sandringham estate and is a special part of West Norfolk. Wolferton is best known as the location of Wolferton Railway Station. The station which was on the Lynn to Hunstanton line opened in 1862 the same year that Queen Victoria had purchased the site of Sandringham House. Over the years, a set of elegant reception rooms were developed at the station, where the several generations of the royal family and their visitors would wait for transportation to Sandringham House. The station closed in the 1960s. For some time parts of it were maintained as a museum but the buildings started to deteriorate until it was completely renovated and converted to a residence in the late 1990s. Today, although privately owned the splendid station buildings, platforms and signal box can be enjoyed from the road side. 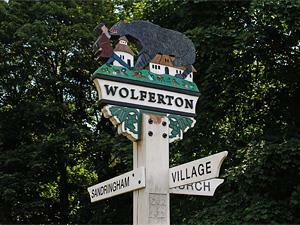 The village of Wolferton is situated 7 miles north of King’s Lynn and just 2 miles from Sandringham House. Indeed the village is located within the Sandringham estate and is a special part of West Norfolk. Slightly away from the village St Peter’s church is a large church of the late 13th century. Apart from carstone walls and tower, it was destroyed by a well-documented fire in the late 15th century. After gradual deterioration it underwent a significant restoration in the late 19th century.